Maybe some of you know or have already worked with Adobe products like Premier Pro or After Effects. From the perspective of a UI developer there are many cool things about these products. For example you can seamlessly fade the brightness of the UI and it looks great in every brightness level (which seems to be a hard task). This is cool because there are good reasons for users to prefer either a dark or light interface. For example some creative artists like to work in a dimmed office so that no light from outside is overlaying the colors picture/video they are working on. In this situation a dark user interface is better then a light one because it's more comfortable for the eyes. On the other hand I know people how prefer a light and friendly user interface because a dark one would give them a depressive fealing. So it can be a big plus for the usability of your application when you allow the user to adjust the brightness of your app. Something like this can be done with JavaFX too. 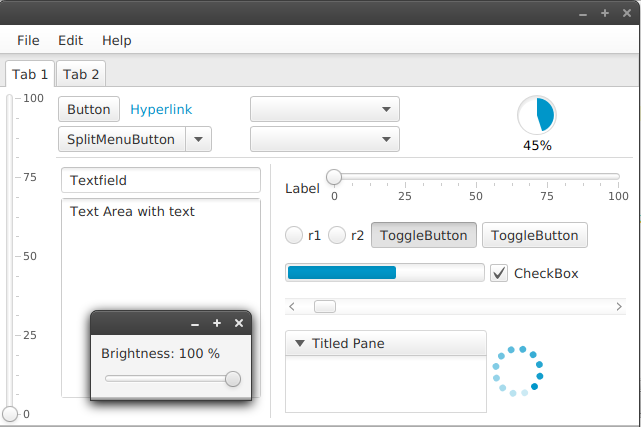 With JavaFX 8 there was a new default stylesheet created known as modena. In this stylesheet there is a color definition named -fx-base that is, as the name suggests, the base for all other color definitions in the stylesheet. When you adjust the value of -fx-base all other colors will be adjusted automatically in relation to -fx-base. The first thing to do is to create an IntegerProperty that will hold the brightness level in a range from 0 to 100%. After that we create a StringExpression (which is a base class of StringBinding) that contains the style definition of -fx-base with the value of our brightness property. For this task we can use the Bindings.format method that takes a format string and an observable value. In the example I'm using the rgb css method to define the color. This method takes the color information for every channel in a range from 0 to 255. For that reason I'm creating a DoubleBinding that contains the multiplication of our brightness property (from 0 to 100) with 2.55 so that the value range is correct. The last step is to bind the style property of the root container of your application to the StringExpression with our style definition. 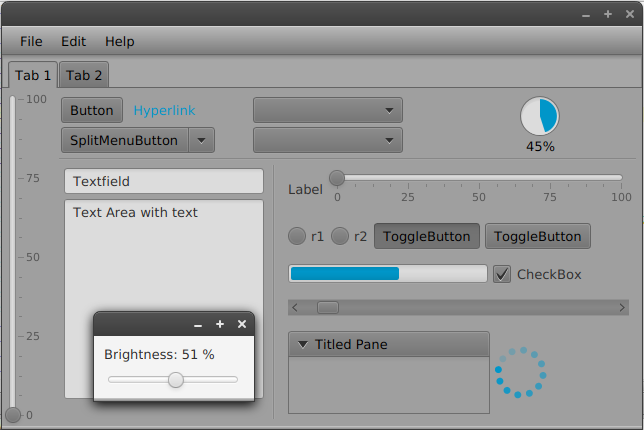 This way the styling of the application is adjusted everytime the brightness property changes. I've created a small example app that shows the usage of this binding. In the app I have bound the brightness property to a slider so you can change the brightness level without interruption. 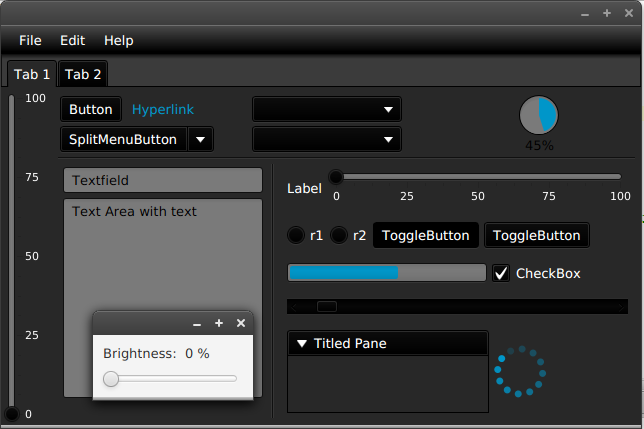 To demonstrate the effect I created a dummy form with some JavaFX controls. You can find the example code on github: https://github.com/lestard/javafx-brightness-example. Feel free to use it in your own applications! There are binding method for basic operations like add, subtract, multiply, divide. But what if you need some more specific operations like exponentiation or sine? In the future I will add more useful helpers and custom bindings. If you have ideas feel free to add an issue at github. As you probably already know I'm a big fan of the AssertJ library. That's the reason I've done a talk about it at the JavaUserGroup Görlitz. I like the way you can write readable unit tests and are supported by the IDE because AssertJ is implemented as a Fluent-API. In the past weeks I've written a package of assertions specially for JavaFX. With this assertions you can verify the values of JavaFX Properties and Bindings. The project is hosted on github: https://github.com/lestard/assertj-javafx. Tell me what you think. If you have ideas for new assertions that could be added feel free to add an issue in the issue tracker. 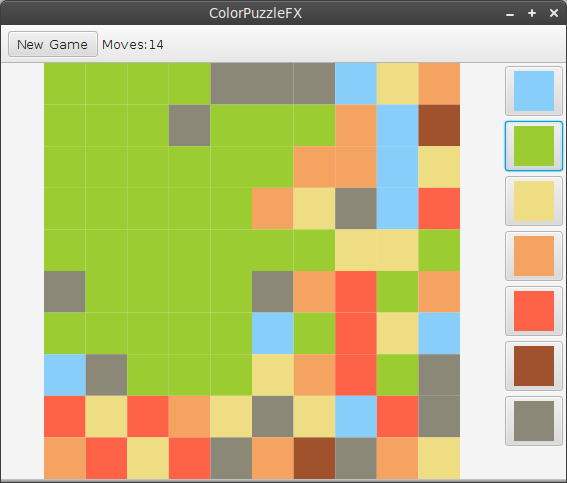 This time I was interested in JavaFX 2 and again I was developing a little game as an example. 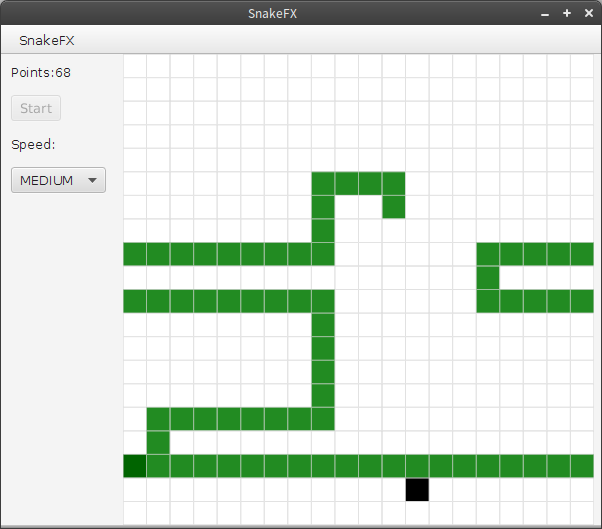 Again I tried a "snake" like game as you probably know from old mobile phones. As the player you are controling a Snake that eats food that is laying around. Everytime you eat something to gather points and grow a little bit. The goal is to gather as many food as you can without byting yourself in the tail. In my version of the game there are no walls: When you move outside of the field on the left side you are immediatelly returning on the right side. The development started in october 2012 with some experiments with JavaFX, FXML and dependency injection. 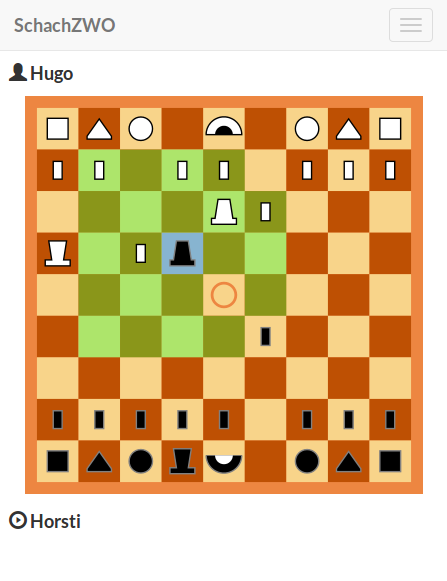 The first version of the game was based on maven and javaFX version 2. In november 2012 the first version of the game was ready. 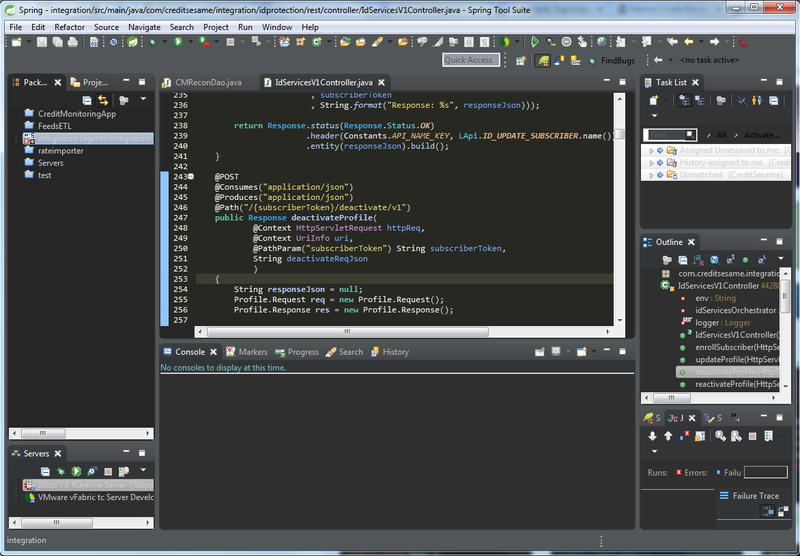 It was based on maven and JavaFX in version 2. The dependency injection was implemented by hand without a DI framework. After a long pause with no coding in may 2013 I returned to the project and started with a big refactoring. The code wasn't realy nice and the coupling between the components of the game was relatively tight. The idea of the refactoring was to encapsulate the state of the UI in a ViewModel. Another change was the usage of JSON for persisting highscores instead of CSV. This way I was able to remove a lot of code for CSV parsing. In november 2013 again I made some changes to the game after another pause. The biggest change is the use of Gradle as build system instead of maven. I also done a big refactoring of the dependency injection system and simplified the code of the program. Another big simplification was the usage of Java 8 instead of Java 7.